THE 1066 COUNTRY WALK book - now available! The 1066 Country Walk traces the footsteps of William the Conqueror from his landing at Pevensey, via Battle where his victory over King Harold changed the course of English history, to finish at Rye. 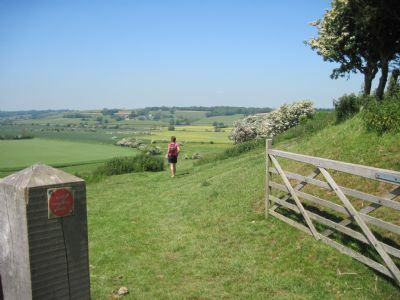 It makes a superb weekend walking break, covering 32.12 miles of some of the most spectacular countryside in the South East! The book is recommended by the 1066 Tourist Board. For the first time the Walk is broken down into 6 separate stages by local author Nick Brown, each with its own sketch map, superb photos and snippets of local history. In addition his detailed guide to refreshments, accommodation, public transport, useful websites and FAQs provides walkers with all the essential information needed to plan their itinerary. There are also 6 circular walks in the second half of the book, thus allowing walkers an opportunity to explore even more of the 1066 area!